A Denver Broncos player visited a cancer and heart transplant patient the night before the Super Bowl and was moved to tears by the encounter. Alex Walter, who is undergoing treatment at Lucile Packard Children Hospital Stanford, is an ardent Broncos fan who had long dreamed of meeting a team player. His surprise came in two parts. Walter, 18, was first bowled over Tuesday when Vernon Davis decided to stop by. The Montana teen again was left dumbfounded Saturday when the tight-end handed him two tickets to watch Super Bowl 50 between Davis' Broncos and the Carolina Panthers. Walter said he has been a Broncos supporter since he was 2 years old and is particularly in awe of wide-receiver Demaryius Thomas as well as Davis, for whom he made a bracelet out of his Beads of Courage. Deeming the experience "cool," Walter said he was excited for the Broncos to defeat the Panthers and to be able to watch them do it. He said he plans to give his second ticket to a friend who is also a patient at Lucile Packard. Meanwhile, Davis teared up looking at the beaming teenager. "It brings joy to my heart ... to be able to give him the tickets," he said. "It means a lot to me … to see everything come to fruition for him." 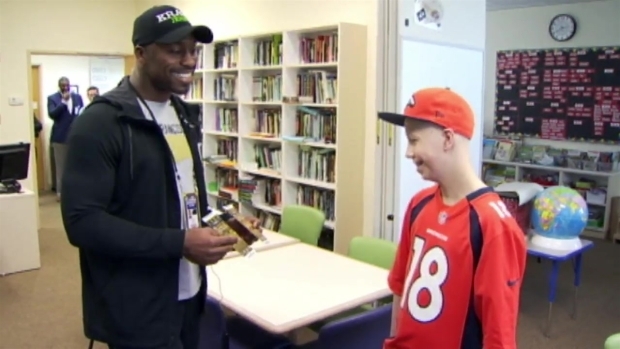 Denver Broncos tight-end Vernon Davis surprised cancer patient Alex Walter with tickets to watch Super Bowl 50 on Saturday. Davis said also that he makes a conscious effort to be compassionate and uplifting and found himself filled with gratitude at being able to "share this experience" with Walter. Pediatric oncologist Sheri Spunt recalled Walter predicting that he would "freak out" if he ever met the Broncos, prompting hospital officials to take to social media earlier in the week to get the team’s attention. Walter, who attends classes at Lucile Packard, has to undergo chemotherapy for a year and also been through radiation therapy, she said. "He was born with congenital heart disease and had multiple heart surgeries and, ultimately, required a heart transplant," Spunt said. "Then unfortunately several years after that he was diagnosed with Rhabdomyosarcoma, which is a relatively uncommon type of childhood cancer." A lifelong Broncos fan herself, Spunt quipped that she was jealous that Walter would be at Levi’s Stadium in Santa Clara on Sunday. "Going to the Super Bowl is awesome and I know that he is going to be very excited," Spunt said. "He’s the kind of guy who comes even during the off-season wearing his Broncos gear. So I know he will be absolutely thrilled to go to the Super Bowl and see his favorite team." For her part, Walter’s mother Ronda also shared in her son’s amazement. "He is so excited about the whole experience!" she said. NBC Bay Area's Robert Beasom contributed to this report.